Home \ Hollywood \ SHAZAM! DC have hit a bit of resurgence as of late. From 2017 they hit form with Wonder Woman, a film that shattered all expectations critically and commercially. They had a bit of a dip with the highly anticipated Justice League, a film that went through a weird production cycle and reshoots that resulted in the Avengers director Joss Whedon coming in to finish the project. It released with middling to poor reviews and was considered a box office failure despite drawing in $657.9 million against a $300 million budget.2018 proved to be a better year for DC as the standalone Aquaman film was well received and became the companies first billion-dollar movie since the Dark Knight Rises (a film outside the DCEU) as it took home a box office of $1.147 billion. 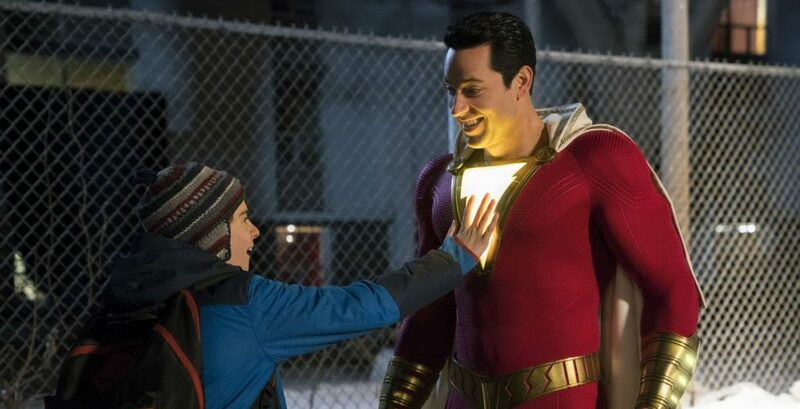 It seemed that turning away from an expanded universe and focusing on individual stories was the best route DC should have taken along the way and it seems that they are taking that approach with today’s film Shazam! Shazam! formerly known as Captain Marvel (who lost it after a lengthy legal battle with Marvel over ownership of trademark) finally gets his opportunity to shine on the silver screen. 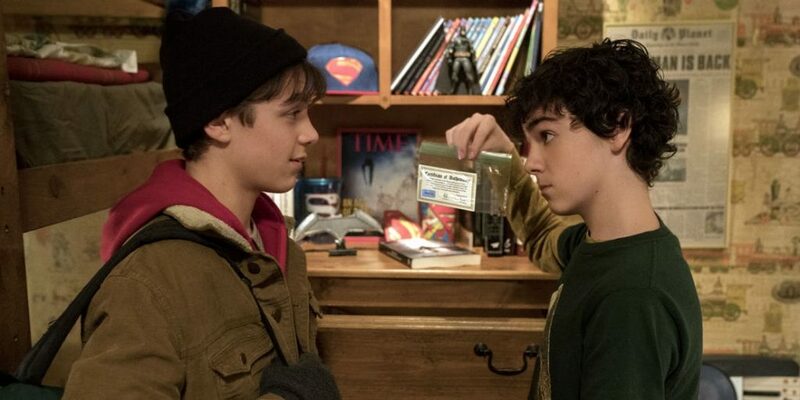 Set in the same universe where meta humans are now a known entity, Shazam tells the tale of Billy Batson (Asher Angel), a troubled 14-year-old kid who jumps from foster home to foster home whilst looking for his mother who abandoned him. He is placed in a foster home with kind parents and foster siblings including Freddy Freeman (Jack Dylan Grazer) a crippled boy who is big fan of superheroes. After Freeman gets attacked by bullies in their high school, Batson jumps in to save Freddy and gets noticed by aging wizard Shazam (Djimon Hounsou) who is running out of time and gifts him with his power. 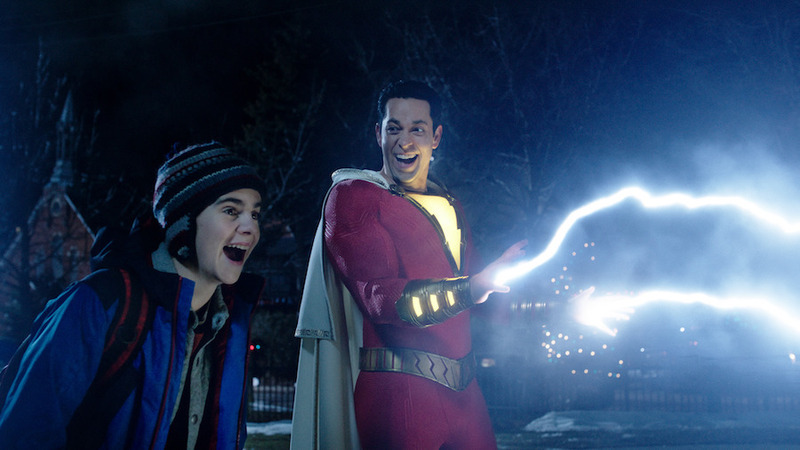 Batson has to shout out the wizard’s name and he becomes adult superhero Shazam (Zachary Levi). Batson gains the wisdom of Solomon, granting increased intellect; the superhuman strength of Hercules, the superhuman stamina of Atlas; powers from Zeus, including the ability to summon lightning; the increased courage of Achilles, as well as being nearly indestructible; and the superhuman speed of mercury, which provides him with the means of flight. Confused about his situation Batson turns to Freddy, a superhero expert of sorts to help him figure out how to hone his new-found abilities and leaves us asking whether kids with superhuman abilities will use their power for their own gain or use it responsibly and for the greater good. This question will be put to the ultimate test when Dr. Thaddeus Sivana (Mark Strong), a man who has a connection with the wizard Shazam comes into the fray and tries to take Batson’s powers for himself. This movie is helmed by David F. Sandberg, a director well known for his horror film efforts in the guise of Annabelle: Creation and Lights out and looks to take a page out of films like Tom Hanks’ Big and add a supernatural ingredient to the concoction. 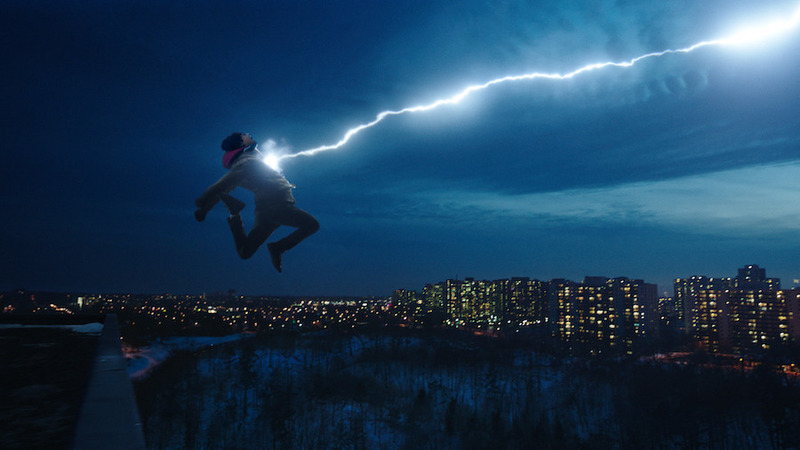 With all the things its going up against, does Shazam! end up being a refreshing ode to 90s cinema and continue Warner Bros. and DC’s good streak? let’s observe. The emotional core and the strongest aspect of the movie without a shadow of a doubt is the Vasquez family led by the caring Vasquez couple, Victor (Cooper Andrews) and Rosa (Marta Milans). Billy is inducted into this quirky family that includes the like of college-bound Mary (Grace Fulton), Tech-Savvy and electronic obsessed Eugene (Ian Chen), the nosy but adorable Darla (Faithe Herman), the shy and sensitive Pedro (Jovan Armand) and the superhero obsessed Freddy Freeman who ends up being Billy’s confidant and sidekick of sorts. Excluding Freddy, the Vasquez family don’t get as much screen time as you would like but they do leave an impression and drive home the theme that family isn’t about blood but rather bonds something a lot of people will be able to relate to. It also gives the movie a lot of heart something that a lot of DC movies have been missing up to this point. The movie takes a fairly conventional route through a Superhero origin tale but it’s distinguishing feature that separates it from the rest of the pack is that the whole experience is viewed through the eyes of two teenage kids who aren’t burdened with responsibilities and are teens who view this new-found power as a new source of excitement. I also really enjoyed how self-contained the experience was as it didn’t really worry about the wider DC Universe set up in Man of Steel. While the film still has references to the other DC stalwarts they don’t distract the audience from the overall narrative and end up being pleasant Easter- eggs that enhance the experience. They say some actors are born to play certain roles. 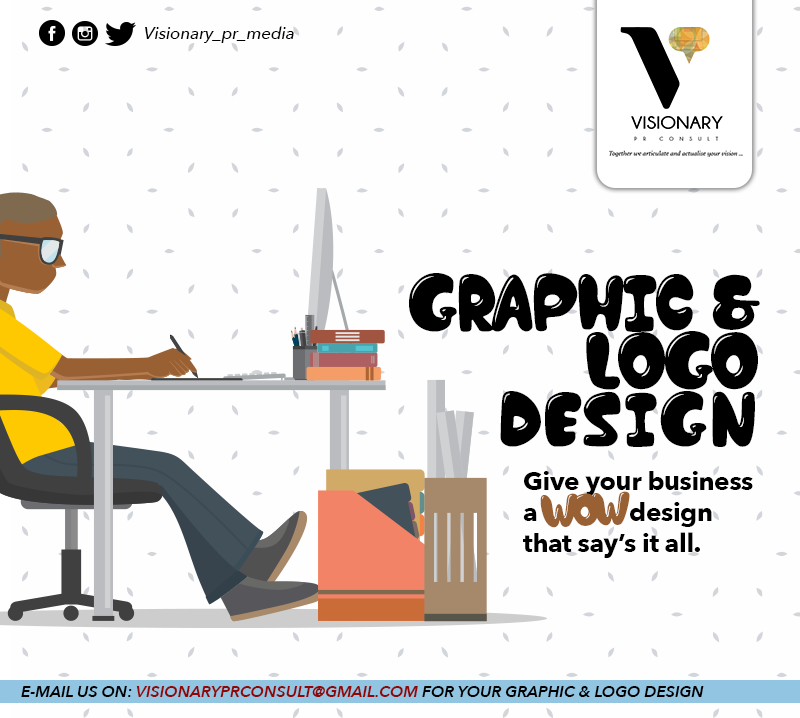 We have heard many say it for Robert Downey Jr. as Iron Man, others have said it for Hugh Jackman turn as Wolverine and Ryan Reynolds for his recent performances as Deadpool. After watching this picture it’s fair to say that Zachary Levi gets to sit on that table as he plays the adult version of Batson with distinction. He perfectly captures the mannerism, innocence and the exuberant youth of a teenage boy in the body of an adult. This aspect along with his charisma and comedic timing ensures that the film has its likeable but flawed lead that you are rooting for from start to finish. Asher Angel who plays the teenage version of Batson really does a great job portraying the character as he holds down the film’s most dramatic moments. Jack Dylan Grazer who plays Freeman also puts up a good show and ends up bouncing of both actors that play Batson very well. 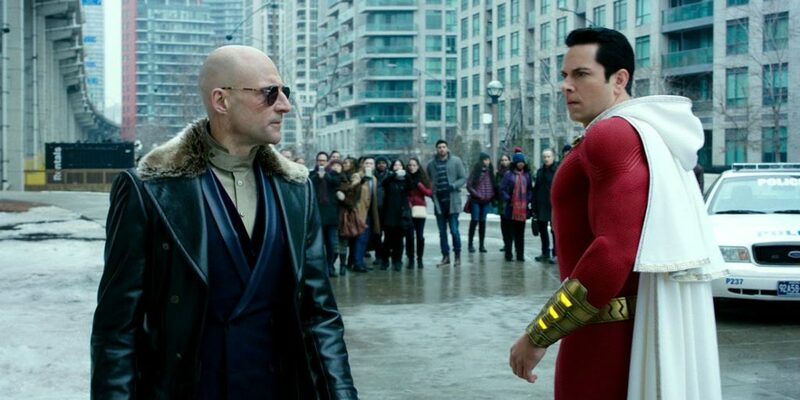 Though Mark Strong puts in a good performance and genuinely has fun with the role of Dr. Sivana, ultimately the villain feels a little shallow as a result of the film not using its duration properly to flesh out the character. The film does give him a serviceable origin tale that sets him up as the antagonist of the story, but the narrative leaves way too many gaps which as a result creates a one-dimensional villain. He does implant himself as good foil to Billy Batson as he plays the straight man of the proceedings when he is in battle with Batson. The movie has struggles balancing its tone between comedy and drama at times. Sandberg falls back to his horror habits and has dark scenes that aren’t completely compatible with the rest of the movie. It’s not a deal breaker but it is definitely noticeable and a bit odd. The film’s climatic set piece, whilst entertaining in spurts meanders a bit and ends up being a bit on the long side as the film inserts unnecessary pomp and grandeur to what is supposed to be a relatively grounded and silly affair. Shazam! is a superhero origin tale with a lot of heart and comedy that separates itself from a crowded genre. Without a doubt one of the best DCEU movies to date and one you should definitely checkout.